Le Patin Libre performs a show called Threshold on August 3 and 4. Le Patin Libre has performed on the Vineyard two times, during the cold winter months which seems fitting as it is an ice skating show. 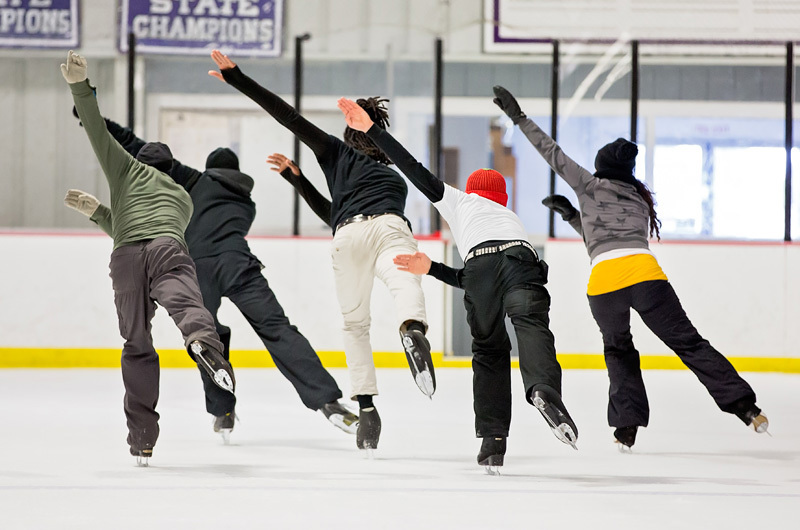 But what about summer, when it is so hot out that a trip to the ice arena would be a refreshing change, with the added bonus of seasonal visitors getting a chance to witness the magic of this dance troupe that has taken to the ice? Summer audiences are in luck as Le Patin Libre is headed this way for three performances, August 3 at 7 p.m. and August 4 at 11 a.m. and 7 p.m. at the ice arena. The August 4 7 p.m. performance includes an after-show ice skating party with the cast, beginning at 8:30 p.m. Skate rentals are available and anyone who has seen any of the three shows is welcome to attend. There will also be a skating workshop open to all ages and levels and led by the company on Thursday, August 2, from 10:30 a.m. to noon. The show is called Threshold and promises to be unlike anything you have ever seen before. The Canadian group’s association with the Vineyard is thanks to the Yard, and is a mix of skating, break dancing, tap dancing and a whole lot more that doesn’t fit into categories or words. Know that it is an event not to be missed. Visit dancetheyard.org or call 508-645-9662 for tickets and more information.